All about fishing for northern pike, sauger, saugeye, and tiger muskie in Colorado. This state offers unique fishing opportunities. Listed below find information about these species of fish, found in Colorado waters. When fishing for these fish in Colorado, you are likely to find them in some of the larger lakes - including Adobe Creek Reservoir, Blue Mesa Reservoir, Crawford Reservoir, Eleven Mile Reservoir, Grand Lake, Green Mountain Reservoir, Horsetooth Lake, John Martin Reservoir, Lake Granby, McPhee Reservoir, Navajo Reservoir, Riverside Reservoir, Stagecoach Reservoir, Taylor Park Reservoir, Williams Fork Reservoir and Wolford Mountain Reservoir, plus smaller lakes as well as in ponds and rivers throughout CO. Click here for a detailed list of Colorado fishing lakes. 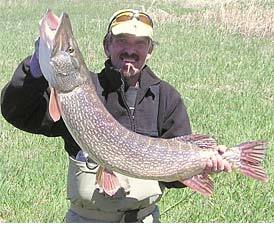 Andy Meehan of Solitudeoutdoors.com shows off a 40-inch, 20-pound pike caught on a fly rod. Many of the species we portray as "other" in this website are simply not as commonly fished for as the more popular fish. For insight into some of these "other" fish in Colorado, visit the other fishing page for more in-depth information. Best fishing lakes in Colorado!